Only 3 hours from Bangkok on Sukhumvit road to the city that famous for its abundance of tropical fruits and as a centre of gems, verdant forests and scenic water fall. 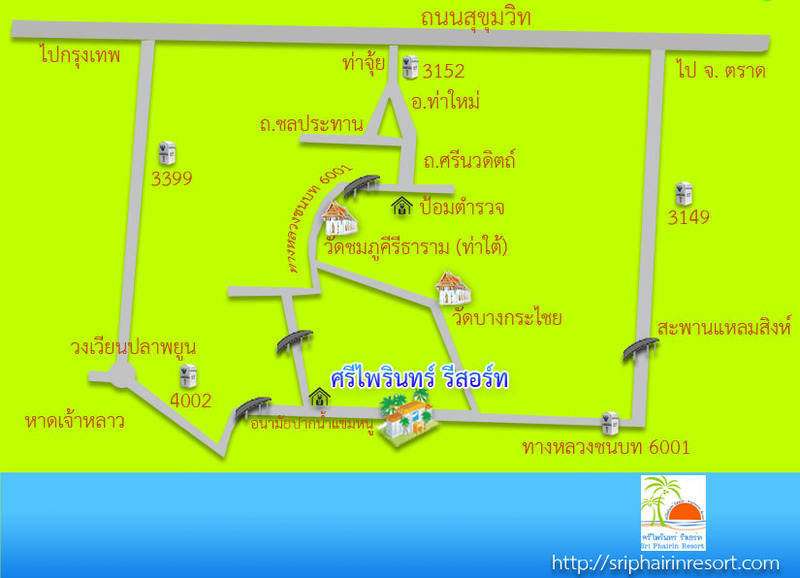 The trip to Sriphairin Resort would go through the main road number 344, pass Amphur Klaeng until you find the junction road then turn left to the main road number 3399. About 35 kilometers from the junction you would meet the green roof of Sriphairin resort along by the sea. Haad Bangkachai. The driver would drive along the road by the sea until you reach Sriphairin Resort.